Versa Adaptive Cutting Technologies (ACT) systems include a 1″, 2″, or 3″ capacity servo extrusion cutter on a 4″ slide base, a pinch roll or caterpillar servo driven puller, a 7″ color touchscreen interface with built-in length and batch control, a variety of screens for controlling a cut output signal for a air ejector or product diverter, an upstream laser gauge, or puller remote speed control using a ditigal or anolog signal. Versa ACT series systems can achieve cutting rates up to 3,000 cuts/minute, and hold cut length tolerance of +/- 0.005″ or better cutting rigid materials. All systems are built on a heavy duty steel table with casters and leveling screws. Cutting Rate Up to 3,000 Cuts/min. 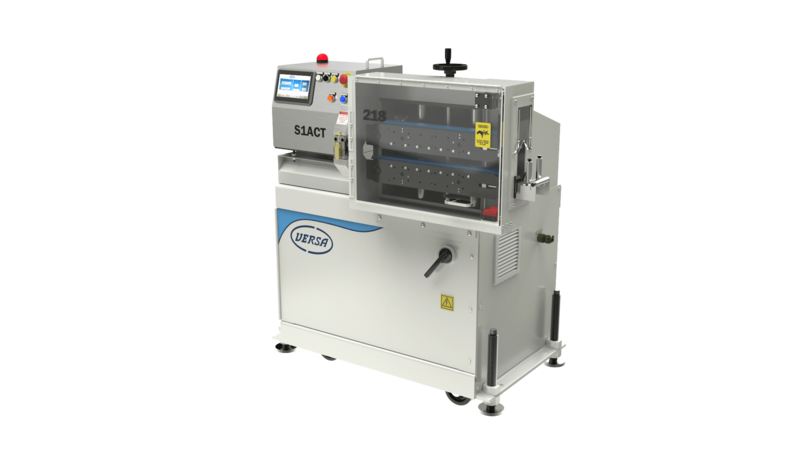 Our Servo Cutter – VFD Puller systems include quiet, efficient, servo extrusion cutters in place of the DAC cutters. The servo cutters provide maintenance free operation and the options to choose one of three knife speeds for cutting a variety of materials. Our servo cutters can achieve cutting rates up to 1,000 cuts/minute. They can hold +/- 0.005″ cut length tolerance when cutting rigid materials.